L.O. 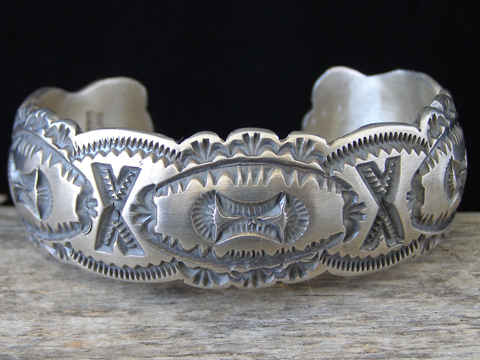 Morris Stampwork Bracelet size 6 3/4"
This beautifully deep-stamped cuff by L.O. Morris has sculpted edges and is formed to convexity which gives the cuff extra tensile strength and durability. This is a one-inch wide cuff which was bent to convexity so that its resultant width is 7/8". This is very well-made and shows design and execution skills that outstrip its modest price. We hope to get more of this silversmith's work. Hallmarked L.O. MORRIS and stamped Sterling inside.